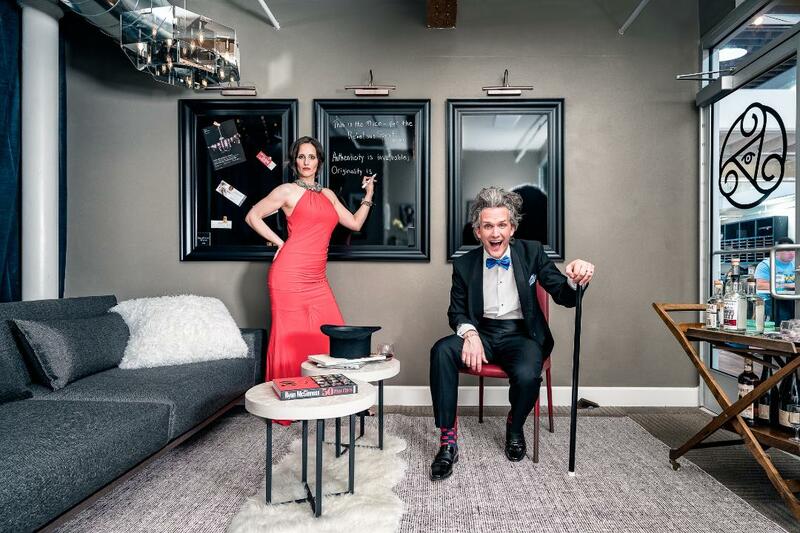 Joy Haynes and Steven Labrum show their playful site at their Impact Hub office. What started as a weekly challenge between two friends to do something – anything – creative has grown. Today the two friends, Joy Haynes and Steven Labrum, still embrace the playfulness of their original intent, but they now have a part-time office and lots of willing collaborators. The results of these collaborations may be small and intimate or enormous — like the side of four-story building. Driving north on State Street, just past 200 South, look up to your left. Yes, that’s it. 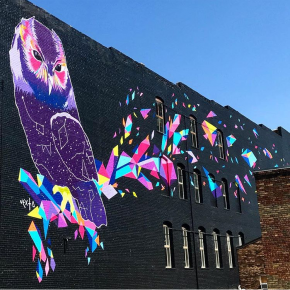 The huge mural — black background with an owl and colorful explosions — that takes up the entire south side of 150 S. State is a Labrum-Haynes production. No, they did not paint it. They took an idea and made it happen. They call themselves a creativity support group. It’s an evolution from their weekly creative projects. It was on Oct. 20, 2016, that they decided they could eke out the time for about three creative irons in the fire at any given time and decided to call this thing they were doing “3 Irons.” Each week they challenged each other to take a fabulous photo, or sing a song, or write a three-minute play; projects that took minimal time but exercised their creative muscles. After attending the Sundance Film Festival in January, Haynes and Labrum began to focus on a much bigger project – submitting a proposal to the Festival to produce the “bumper,” the animated film prelude to each of the festival films. Soon after that, Labrum was in New York and came across a book about an artist who produced 100 parties in a year. He returned to Salt Lake City and suggested to Haynes that they produce 50 creative projects in 12 months. Within a few weeks, they had rented an office at Impact Hub, a creative business incubator on State Street, and officially launched the “50 Irons Project” on April 1, 2017. Since then, they’ve produced nearly 30 projects, and they’re on target to complete 50 by March 30, 2018. What a great business concept, you may be thinking. But it’s more of a huge, time-consuming hobby at this point. A business plan may come later. Haynes is a part-time immigration lawyer who moved to Utah from the Washington, D.C., area. She knew Labrum because his wife has been her best friend since junior high school. In addition to her legal work, she’s an actress and producer. She decided about 12 years ago to give priority to the art in her life and this is part of that journey. Labrum is an entrepreneur who has been part of a bunch of business start-ups. Currently, he co-owns and serves as finance director for the Eva Carlston Academy, a residential treatment center for teen girls. As if entrepreneurship was not creative enough, Labrum found himself in an existential crisis in his 30s. “Is this all there is?” he wondered as he took stock of his life. He knew he wanted to stretch creatively because, well, creativity is in his DNA. His mother was a clown and his grandfather was a magician. Among the Irons: (#11) Find a dialect coach to teach a group of people how to speak with a British accent, then go to the London Market together for tea (accent required). (#16) An out-of-the-blue email from artist Megan Hallett suggesting a collaboration eventually led to a 10-minute production about “Interruption,” reflections by a group of young girls on what the word, interruption, means and how they relate to it in their lives. 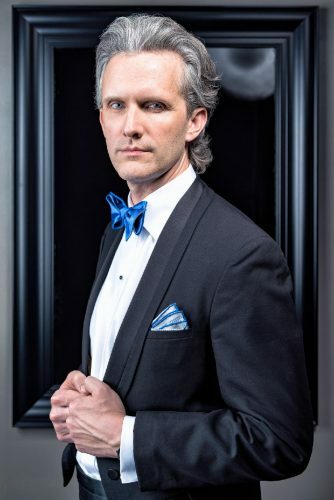 (#15) Find an interesting venue for a fall performance by MOTUS (Musicians of the Utah Symphony) who take their music outside Symphony Hall to an audience that might not ordinarily choose to go to the symphony. 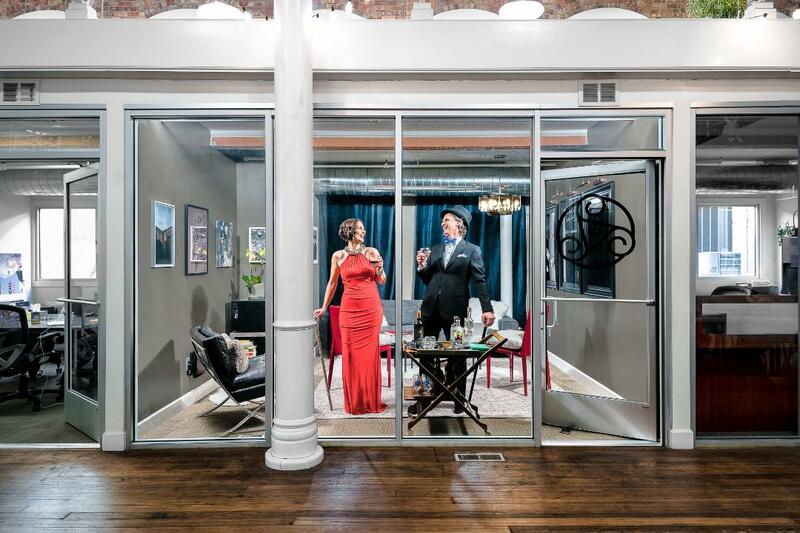 Haynes and Labrum found Skybar, a local nightclub-type venue, booked it for the event, handled event logistics, and worked on getting at least 300 people to attend. The Oct. 18 performance attracted some 460 people. And then there is the mural (Iron #8). It started as an idea from Dustin Haggett, who runs Impact Hub, where 3 Irons has a small office. Then, Haynes was in Melbourne, Australia, which may be the world capital of street art. She bought a small book about Melbourne’s murals and brought it back to show Labrum. They each picked favorites from the book and found three overlapping favorite artists. They found a willing collaborator in building owner Andy Renfro. And they found Vexta, a Melbourne mural artist, currently working in Brooklyn, N.Y., who had the expertise, including the ability to operate a giant boom lift, and artistic vision. 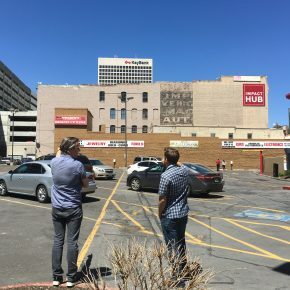 There were other collaborators as well, including investors Rheda Fouad and Amy Leininger, who own The Ruin complex in Sugar House, and Richter 7 advertising agency, which has office space in Renfro’s building. It has been their most ambitious and complicated Iron to date. And sometimes there are irons related to irons. 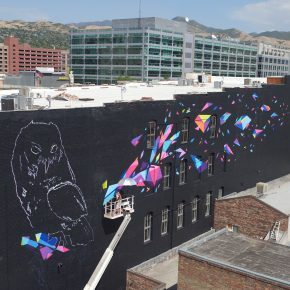 Iron #19 is “Chronicle,” a short film by Brent Rowland that chronicles the mural project. Wall before painting. Courtesy 3-Irons. Vexta at work on the mural. Photo by Marshall Birnbaum. Finished mural. Instagram photo by @Tag_PDX. Or, if you’d like to be part of this adventure and stretch your own creative muscle, check out Iron #29 – The Eulogy – on their FB page. Participants will be trained to write a eulogy for a living person they know well. They (and the eulogy subject) must agree to be videotaped as the writer reads the eulogy aloud. Not a writer? 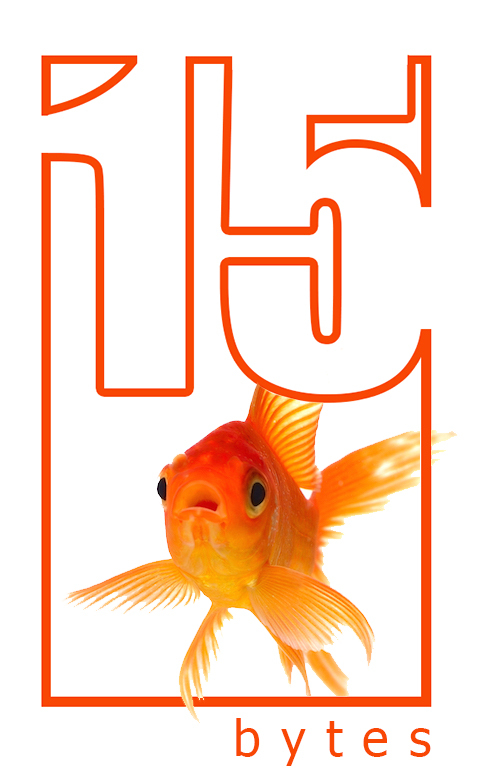 Well, stay tuned for other opportunities; there are still about 20 projects to go before the end of March.